It is known that leaking valves represent a major safety risk and are a major source of lost profits. Find leaking valves with Midas Meter® long before detection by conventional methods or instrumentation. Avoid product losses to the flare and fugitive emissions, confidently prepare for maintenance outages and avoid excessive valve damage due to prolonged leakage. The MIDAS Meter® is the next generation in Acoustic Emissions (AE) valve leak detection equipment designed and manufactured by Score Group plc. The ergonomic handle allows easy and comfortable one handed operation of the fully self-contained and portable device. 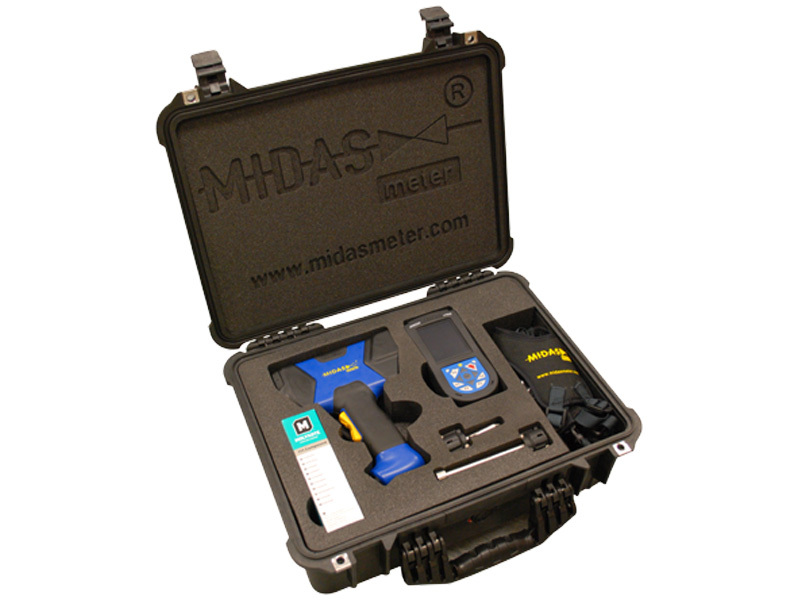 The MIDAS Meter® can be used as a stand-alone unit or in conjunction with a compatible, Score approved PDA with Bluetooth connectivity. The device measures the RMS value in decibels (dB) of the acoustic emission noise between the frequencies of 60 and 600 KHz. This frequency range eliminates all audible and mechanically generated noise, which is usually of a much lower frequency. The instrument output / Average Signal Level (ASL) is displayed on a liquid crystal display in dB, with a single membrane button and rocker switch providing simple operation of the unit. Valves are monitored by placing the MIDAS Meter® sensor on to the valve and recording the readings via the PDA which runs the MIDAS Meter® software application. In the absence of a PDA readings can be recorded manually using the related forms. The sensor is a piezoelectric transducer which detects the mechanical energy carried by the acoustic wave. The sensor requires that an acoustic couplant be used to ensure efficient transfer of the acoustic signal into the sensor. The sensor is limited to a maximum surface temperature of 125°C. For any temperatures above this a wave guide attachment must be used. Waveguides are also used in areas of difficult access for the MIDAS Meter®. The instrument contains a Lithium-ion rechargeable battery pack, battery life is typically 10 hours on a single four hour charge. The charging point is accessible via the sealed connector on the base of the handle, with a typical charge time of 3- 4 hours. On completion of full charge the battery charger will cut out and stop charging, so as not to over charge. Score-Atlanta purchased Dunengan Engineering Company, Inc. (Hal Dunegan) in 2009. Following a long legacy of advancements by Hal Dunegan, Score-Atlanta provides portable systems used to detect leakage through process plant valves and piping and a complete range of acoustic emissions sensors and data acquisition hardware for monitoring piping, pressure vessels and other steel structures.